George is a happy, determined four year old boy with an ability to win all hearts. He has a diagnosis of Cerebral Palsy. When George started school he quickly made us aware of all the clever things he could do and his potential to achieve great things. 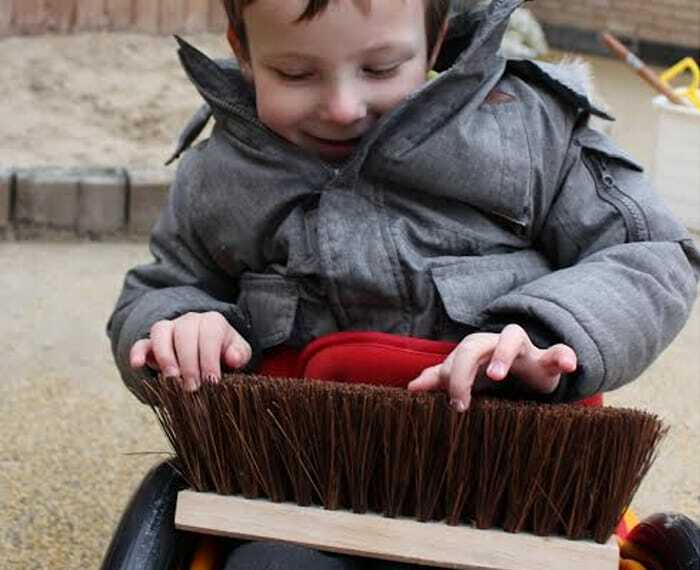 George attends a primary school for children with severe learning difficulties within the UK. As George’s teacher I could see that he had great upper body strength from the way he pulled himself up onto equipment in class. George has reduced trunk control and therefore cannot sit up unaided. The options for George to move around without equipment were limited to crawling. When helped out of his chair he would usually lie on the floor, and in a busy class or when travelling around school he needed to sit in his supportive chair. This limited his choices and I was convinced that with the right equipment he could self propel and move around independently. After searching the internet I was thrilled to find the Scooot, it looked perfect! Even better, there was an optional advanced backrest to help him sit up. I also loved the look of Scooot – it was so bright, fun and cool. The first time we tried the Scooot we were in class on carpet. George was very interested in the wheels, leaning over to look, but did not manage to self propel. But in the school hall on a hard floor, he moved about independently. We were amazed by how quickly he got it. He even got a head teacher award for being so clever! Since then, George has continued to make progress and soon learned to manoeuvre the Scooot on carpet. It was fantastic to see George’s spatial awareness developing. 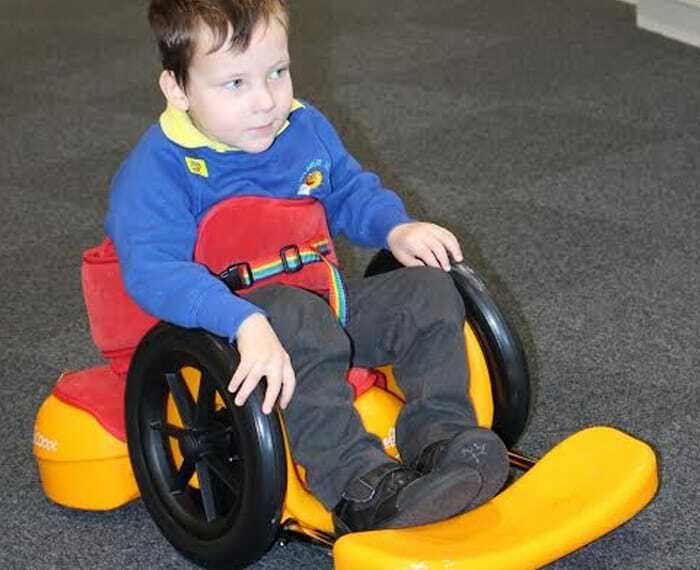 Having access to the Scooot will give him such a head start if he needs a self-propelling wheelchair in future. 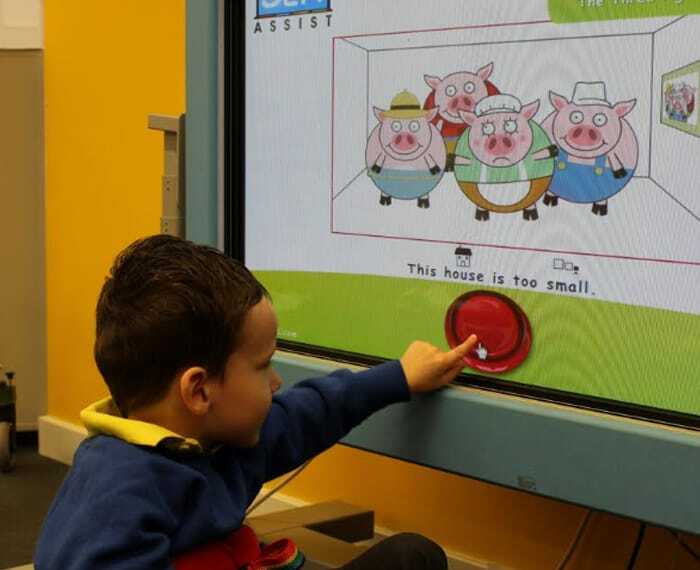 George is very motivated and clever with computers so he was chuffed to be able to move towards the interactive whiteboard independently and use a switch on the screen to see the next part of a story. Recently we were transitioning back to class and George stopped to watch a screen in our school reception and did not want to move on. I tried to encourage him with a little push. George pushed himself back and then he held his hands on the wheels to ensure I didn’t try this again. George responded to an explanation followed by a count down and moved on once I said screen was finished. Without the Scooot he would have found it hard to communicate and impossible to negotiate. Imagine how frustrating that could be? 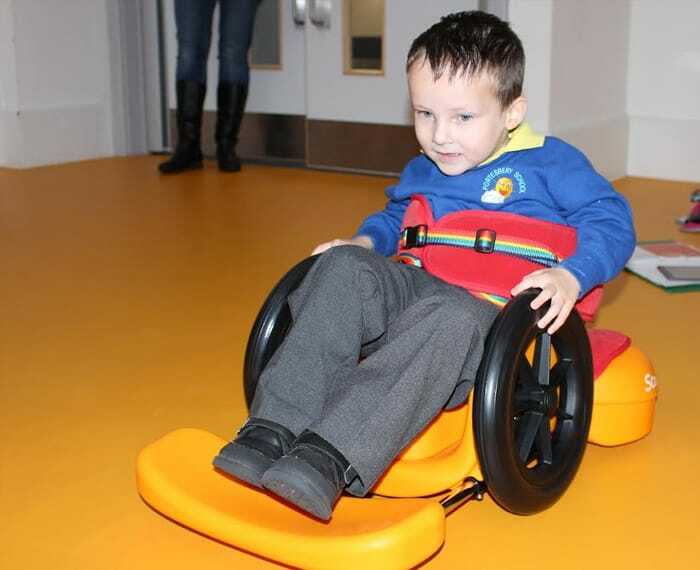 With the Scooot George is able to go where he wants to go to when crawling is not a possible option. He was able to go and get a brush head to explore and loved this. Without the Scooot we would not have known what object he wanted to explore as he is unable to communicate verbally with us. The Scooot has allowed George to explore more inside and show us all what he ‘can do’. It is wonderful to see his big smile and to know that the constant praise he gets as he transitions has a positive effect on his self-esteem. 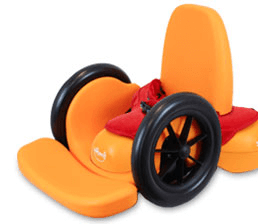 As a Special Needs teacher based in Early Years/Reception I am totally impressed with the Scooot, but also with the whole Firefly philosophy of ‘making things possible’ and I really look forward to trying other products with our special students.